That is what 38 high school students from the Dallas Independent School District (DISD) were about to embark upon during the STEM-Liner Experience held May 19-22 at Kennedy Space Center in Florida. The STEM-Liner Experience is an immersive event designed to empower young people who are interested in positively impacting the world through Science, Technology, Engineering and Math (STEM). From the moment they stepped onboard the chartered Embraer 175 aircraft provided by Envoy, students and teachers participated in a series of hands-on STEM activities facilitated by Microsoft and other sponsors. During the three-day event, the students learned from astronauts, pilots and others about STEM careers, character development and leadership. 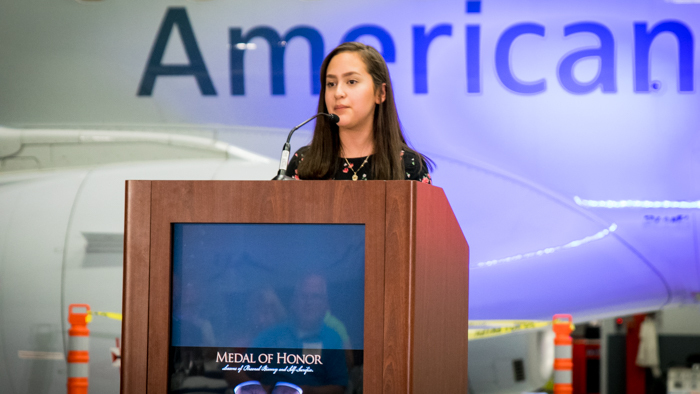 Irma Rangel Young student Karen Chavez addresses the crowd at the STEM-liner event in DFW. Representing Barack Obama Leadership Academy, Irma Rangel Young Women’s Leadership School, South Oak Cliff High School and W.H. Adamson High School, the high schoolers were chosen for the trip based on their academic achievements and commitment to advanced learning. 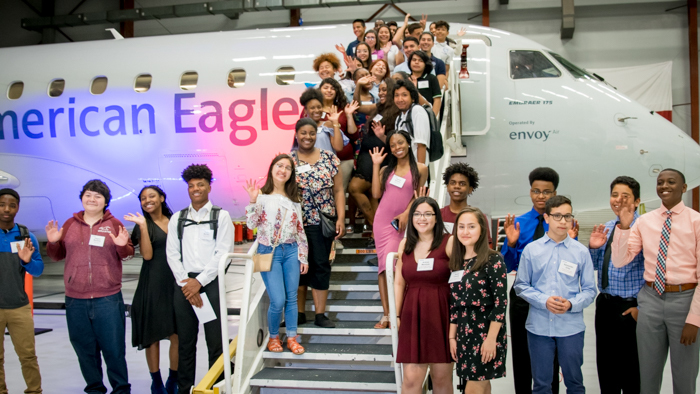 To kick-off the experience, American Airlines, Envoy and several other sponsors hosted a dinner for students, their parents, teachers, and DISD representatives at Envoy’s Maintenance Hangar at Dallas/Fort Worth International Airport. After dinner, students were able to do a quick tour of Envoy’s Embraer 175 aircraft, the same aircraft they would board the following day. Gary Littrell recites the U.S. Pledge of Allegiance with DISD Students. 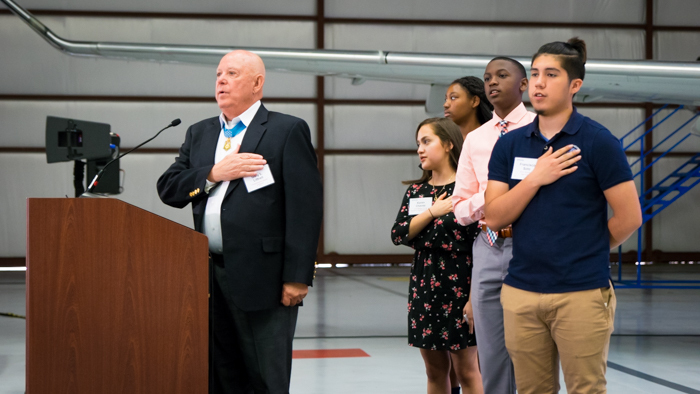 As part of the program, guests were honored to hear from Gary Littrell, Congressional Medal of Honor recipient, on the importance of integrity and character in our society. They also heard from Michael Jernigan, who was wounded in war, but in spite of adversity has become an inspiration to many by sharing his experience. Click here to see all of the photos from the event!